The most common window in American homes is the double-hung, with upper and lower sashes that slide up and down. 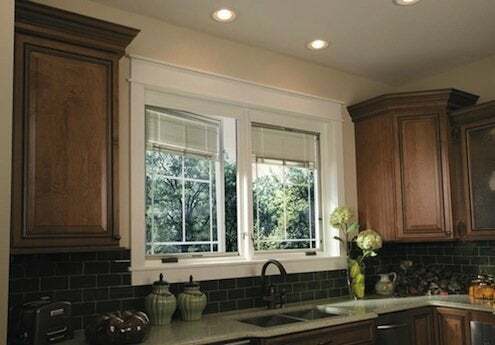 But if you’re planning a project that includes replacing windows, consider a casement instead. A casement window is hinged on one side and cranks open completely, allowing 100% of the window area to be open. It’s an especially good choice over a kitchen sink, where it’s easier to turn a crank at the windowsill level than to stretch to push up a double-hung. It’s also a good bet for a small window, where it can make the most of the limited opening. Some casements come with insect screens that are so fine as to virtually disappear when you open the window. Some models have a handy window-washing feature that lets you temporarily unhook the hinged side, so you can wash both sides of the glass from inside the house. Casements are not appropriate for every window. For example, a double-hung is usually better in a bathroom, where it can be opened from the top to maintain privacy. Casements are not suitable next to patios or porches, or for any place where they’d create a hazard for someone walking by outside. But if you want maximum open space, and you have the clearance outside, a casement just might be the way to go.